Is there any better way to start a three day weekend than with a little blocking? I haven't blogged about this in a while, but my little nephew is scheduled to make his appearance in mid-July. I have to admit, the whole thing still seems surreal to me. My baby brother is going to be a daddy. Don't get me wrong, he'll be fabulous. But he'll always be my baby brother. I will definitely be making this baby some clothing, but since he's arriving in the middle of the summer I thought I'd start out with a blanket. I figure you can't have too many blankies. They've decided not to go too heavy on a theme for the room. They're using a couple pieces from this collection, but mostly it will be solids, stripes and prints rather than lots and lots of animals. So, I decided to use several solid shades to coordinate with the look. Next up was the pattern. Barbara has been blogging about her tesselating fish afghan for a while now. The pattern caught my eye immediately. I think I remember a pattern like this from my childhood, but quilted instead of knitted. Anyway, I love the fishies but after seeing the jungle-themed animals that will be in the room I decided to wait for another baby to make the fishies. After pouring through lots of other blanket books I went with the Entrelac Throw from Baby Blankets Two. There were several that I liked in the book, but I went with this one because I love the construction style. I wanted blocks of color, and the entrelac method will let me avoid lots of block-sewing (which you know I'd be doing late at night right before the shower). I've just started but I'm really happy with it so far. Even though you have a lot less sewing to do you still have TONS of ends to weave in. I've made a promise to myself to weave in all the ends each time I finish a round (the ends at the tips will be done next round because I think it's easier to weave them in when there's another diamond connected). Diana mentioned a while back that she tries to do this on her projects and it really stuck. There's nothing worse than finishing a project and sitting down for a several-hour yarn weaving session. Lining -- The back doesn't look too bad but I'm leaning toward doing a lining right now. I'll wait and see how it feels when I'm done. All those pointy edges will make for lots of effort if I do choose to line it. The blanket in the book is made of CottonEase so the gauge is pretty different. If I make as many squares as what is in the book, I think the blanket will be just over 30 inches square. That seems a little small to me, but since it's Entrelac I'll just knit another row if it is. I'm willing to bet there are more people reading this post who don't know I have a Cheesylove in progress. I casted on for this project almost two years ago. See, the problem is, I miscalculated how much stretch I would lose in the two-color part. And unfortunately, I need lots of stretch in that area. 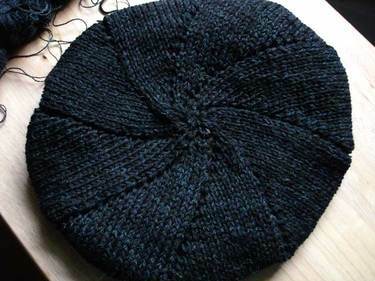 I'm trying to decide if I'm going to knit the two-color part with a bigger needle or if I'm going to increase a few stitches (actually, 12 stitches -- that's one repeat). I got a new toy. 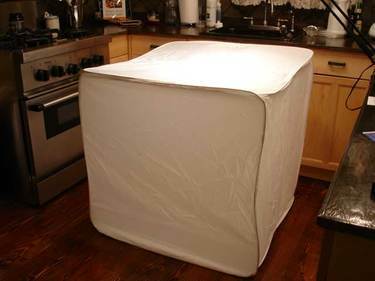 A Portable Light Tent. Fun! One not so small problem. It's huge. HUGE. Here it is taking over in my kitchen. Granted, it's a small kitchen. But take note -- it's bigger than the stove. I guess I never really thought about how big 36 inches really is. The Cheesylove pic I took above was in the light tent. It's pretty good but I need a couple more hinge lights to make it work well. Still, it's not bad. Click on the pic to see it larger. You can actually make out the ribbing. In fact, you can even see a few Isabella hairs. Damn cat. Despite its size the tent folds up compactly -- into a carry case the size of a jumper cable bag. It can easily fit in a coat closet or under the couch/bed. The vendor had smaller sizes too if you're interested but not ready to commit to something this big. After reading through yesterday's comments I decided to put together a slide show on how to do a tubular bind-off. It's going to take me a few days to get the pics together but I will post a how-to for you all. Best part? It's a free web pattern so I could start immediately. The gauge is a bit heavier than I usually like (15 sts over 4 inches). The pattern combines a Cotton Viscose yarn with an Alpaca to get that gauge, but I didn't want to use the alpaca since I see this being a transitional piece I could wear in spring and fall, and selectively in the summer and winter months. After some digging and shopping I went with an unusual combo -- Classic Elite Bam Boo in Black plus 2 strands of Knit Picks Alpaca Cloud in Midnight. Now I know I said I didn't want to use the Alpaca, but I don't think the laceweight should add much warmth. It was *just enough* to get the Bam Boo up to the right gauge. Knitting with the three strands makes for lots of untangling, but so far I love the product. You can't tell in the pic but I've just started the area where the pinwheel starts to come in on the right hand side of each diamond. I'm a little concerned about the fit in two places on this garment. 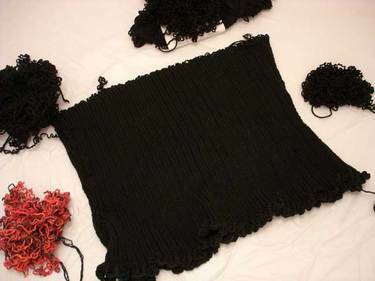 The sleeves are knit by creating a slit with some waste yarn. Once you're done you go back, pickup live stitches and knit the sleeve down from that point. The other place is the neckline -- which judging by the picture could be too wide. This will definitely be knitting by the seat of my pants fit as I go. I think some short rows might be necessary in the collar area but I won't know until I'm at that point. Good times for sure, and it's exactly the kind of kickstart I needed.